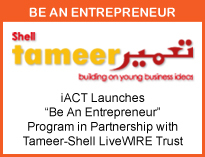 The Institute for Advancing Careers and Talents (iACT) is a not-for-profit career and technical education center established in Saudabad, Malir, by Habib University Foundation in collaboration with the City District Government Karachi (CDGK), offering innovative and futuristic career options to the youth. iACT was created to respond to challenges of burgeoning population and increasing unemployment. It aims to prepare youth for better career prospects through the provision of technical skills, personal and career development skills. The Institute became operational in February 2008, and will be replicated and expanded in various parts of Karachi in the next five years. "Inspiring and establishing innovative and reflective learning spaces to foster a healthly society."